There's a lot to consider here, such as specs, features, design, and price. Thankfully, most of these smartphones come with more than enough power, great designs, and tons of features. The biggest thing to watch out for in the next month is price. 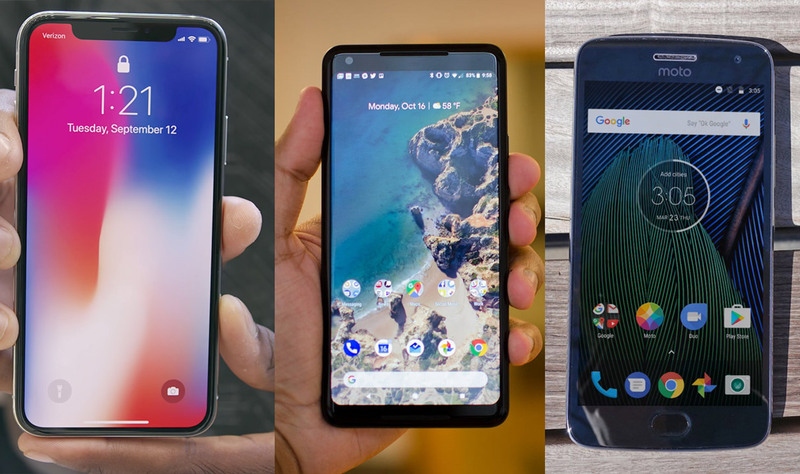 Phones like the OnePlus 5T and Essential Phone cost as little as $500, and there isn't a huge difference between them and the $800-plus phones on this list. Prices of big-name smartphones are increasing, but the moderately priced premium Android phone is clearly making a comeback, and it's better than ever. Check out the top 20 smartphones you can buy. If you're still a BlackBerry fan, you'll love the Classic. It looks like older BlackBerry models but features a sharp touchscreen and an excellent physical keyboard. On the one hand, this a good phone. The screen is great, the software is clean, and the whole thing is superfast. But on the other, with its underwhelming battery and slippery, sometimes uncomfortable design, it's not the device that should reverse Sony's fortunes. The KeyOne is a great device for those who want a physical keyboard and access to Google's apps and services, which aren't available on other BlackBerry devices. The Moto G5 Plus continues to be our favorite budget-friendly Android smartphone. It demonstrates that "good-but-not-great hardware can become strong value at the right price," as Dunn said in his review on BI. It doesn't have as many features as premium phones. For example, it doesn't have an NFC antenna, so it can't be used for mobile payments. And to charge the G5 Plus, you'll have to use a microUSB cable — it doesn't support USB-C, the newer, faster phone-charging standard. The newer phone features an all-metal design, whereas the previous one has a half-metal, half-plastic case. And the new phone has a bigger screen — a 5.5-inch display versus 5.2-inch one. The new Moto Z2 Force comes with everything you'd expect from a premium smartphone. As Dunn noted in his review, it's "very fast, its screen looks good, its cameras are capable of taking nice photos, and it has a razor-thin frame." And its 5.5-inch Amoled display is more resistant to cracking than most other smartphones' screens. However, the Z2 Force is a little too reliant on Motorola's Mods — the company's line of snap-on accessories, including external speakers and bigger batteries, designed for its Z-series phones. Without such Mods, the Z2 Force doesn't feel like a complete-enough device to push it higher on this list. These three devices have similar specs, and are still available from Apple. They're also still amazing smartphones. Apple recently released iOS 11, the latest version of its mobile operating system, and my iPhone 6S Plus still runs great with it. In most respects, it's a great Android smartphone. But it has two notable shortcomings — it lacks a headphone jack, and the borders around its display are relatively large, which is something that now looks old-fashioned in design. The G6 has a good dual-lens camera and a slightly longer-than-average screen that's great for viewing and using apps because it shows more of them than a standard display. The Essential Phone is a gorgeous device. It has a mostly edge-to-edge display and a case made of ultra-premium materials — ceramic on the back and titanium on the sides. It also runs a nearly stock version of Android, which I prefer over the heavily modified versions that Samsung and LG phones tend to use. Overall, the Phone is a great first effort from Essential. It's a speedy performer and takes great photos, too. It has two magnetic pins on its back that serve as a connection point for peripherals, including a 360-degree camera and a wireless-charging dock. The Galaxy S8 and S8 Plus are among the best-looking smartphones out right now. It looks better than Apple's iPhone 8, and it's sleeker than Samsung's Note 8. With the S8 and S8 Plus, Samsung refined the curved glass design it used with the S7. Meanwhile, the ultranarrow borders around the S8's screen make it the new standard for premium smartphone design. In addition to their good looks, the Galaxy S8 phones are full of great features. They're water-resistant. They have taller-than-average screens that allow you to see more of your apps or webpages. They support both fast and wireless charging, and face and iris recognition. They have one of the best cameras, and, unlike Apple Pay or Android Pay, Samsung's Pay wireless-payments service works on pretty much every credit-card reader. The home button is also hidden beneath the display, so it feels more familiar to use than new phones that have ditched the button. With all those attributes, you're likely wondering why the S8 phones didn't make the top of this list: I'm not a fan of TouchWiz, Samsung's software interface that runs on top of Android, and I prefer the clean look and features of stock Android. The S8 phones rely on TouchWiz for face- and iris-recognition capabilities. But those features don't make up for a possible inability to install timely Android updates. The iPhone 7 and 7 Plus are now a year old, but at their new $550 and $670 price tags, they easily beat the Galaxy S8 phones. Apple phones generally offer better apps and a better owner experience than their Android rivals, and the iPhone 7 is no different. The support you get from Apple if something goes wrong is superior to what you get from Android device-makers. And unlike on most Android phones, with iPhones you can always get the latest software updates straight from Apple as soon as it releases them. The iPhone 7 and 7 Plus offer some compelling features, including a water-resistant case, a great camera that performs well in low light, and a powerful processor. The phone also works well with other Apple products, including the company's wireless AirPods headphones. The iPhone 7 Plus' dual-lens camera system is the key feature. It allows you to take pictures with a professional-looking "bokeh" effect, which blurs the subject's background. The second camera in its system is a telephoto lens that offers a 2x optical zoom. Unlike the digital zoom feature found in other cameras, an optical zoom allows you to enlarge an image of your subject without sacrificing picture quality. The Razer Phone is marketed as a "gaming" phone, mostly because of its unique display that plays games incredibly smoothly — it can achieve up to 120 frames per second, whereas most phones go up to only 60 fps. Having twice the fps makes for super smooth gameplay. But high fps isn't just for gamers. The phone's apps and Android operating system get the high-fps treatment too, and it works beautifully. Everything you do on the phone is ultrasmooth in a way we've never seen before on a smartphone — Razer may have inadvertently set a new standard for how all phone displays should work moving forward, not just ones on gaming phones. It also has an eye-catching industrial design compared with most sleek and svelte Android phones. The large bezels above and below the Razer Phone's display may not appeal to everyone, especially since most phones in 2017 have switched to bezel-less designs. However, hiding beneath those massive bezels are the loudest and best speakers we've heard on any smartphone. With its gorgeous design, ultra-thin borders around its screen, a beautiful display, fast performance, a dual-lens camera system, and fancy stylus-based features, the Note 8 takes the best attributes of Samsung's Galaxy S and Note smartphone lines and smashes them together into a phone that's hard to beat. If you're not looking to spend $850 or more on a phone with a large screen, the OnePlus 5T is the Android phone to get. It's a fantastic phone that's only made better by its incredible $500 starting price. It also comes with more RAM than any other smartphone we've tried, guaranteeing top performance. On top of that, its great camera comes with a portrait mode that competes with those of the iPhone X and Pixel 2 phones. And my favorite feature: It runs a near-stock version of Android. The device runs the latest version of the operating system. Because it's unadulterated, that version looks and runs better than any of the tweaked takes on Android other phone-makers include with their devices. Better yet, because the Pixel 2's Android is unmodified, you'll be able to install the latest updates as soon as Google rolls them out. That's not something you can usually do with other Android phones. It's something that I feel is important — who doesn't want the latest software from the top software company in the world? But the Pixel 2 has other features that help put it ahead of other Android devices, including its amazing camera, performance, and battery life. It's like a less attractive but smarter Samsung Galaxy phone. The Pixel 2 is also water-resistant, unlike its predecessor, the original Pixel. But while we rated that device higher than last year's iPhone 7, the new device doesn't out-rate the new iPhone 8. While the iPhone 8 supports wireless charging and ships with a set of headphones, the Pixel 2 offers neither. The Pixel 2 XL has nearly the same components and features that make the Pixel 2 great — but in a bigger package with a larger display and a fresher-looking design. The Pixel 2 XL isn't the best-looking Android phone, but with the narrow borders around its screen, it looks sleeker and more refined than its smaller sibling or its predecessors from last year. You should note, though, that users and reviewers have reported encountering several problems with the Pixel 2 XL, mostly with its screen. I haven't experienced any of them while testing my review unit, so I'm not factoring them into the phone's ranking. Users were also saying that colors on the Pixel 2 XL's display weren't as vibrant as those on other top Android phones. Google has recently issued an update that makes colors more vibrant. The iPhone 8 Plus includes all the best things about the iPhone 8, but it adds a bigger, better screen and a dual-lens camera system that features a telephoto lens and the ability to take shots like those you could capture with a professional camera. With its outrageously beautiful OLED display that takes up most of the front of the phone, as well as wireless and fast charging, the iPhone X has brought Apple's iPhones up to speed with top-of-the-line Android hardware. Android owners always enjoyed the latest smartphone hardware features until now. It'll cost you at least $1,000, but that's the price of near perfection in a smartphone. This post was originally published on: Businessinsider.